Ages 3 through adult.This comprehensive NEW resource includes information about assessing individuals with communication disorders and practical REPRODUCIBLE assessment forms that you can use with children and adults. In addition to structured assessment tasks, observational assessment tools are included that can be used with speakers of any language. Most of the assessments are designed for individuals five years of age and up. Some of the assessment procedures and materials can be used with children as young as age 3. Reproducible measures are included for assessing the articulation, language, voice, and fluency skills of Spanish speakers. Many of these assessments can be adapted easily for use in other languages. Users of other inventories such as Spanish Language Assessment Procedures, will find this book extremely valuable when additional information is obtained in specific areas. This comprehensive volume provides you with tools for assessing basic concepts, language structures, and the pragmatic skills necessary for effective communication. Individual tasks assess skills such as following directions, defining words, giving synonyms and antonyms, making comparisons, creating original stories, and constructing sentences. The tasks make it easy to assess listening and speaking skills commonly emphasized in state curriculum standards. Short stories are used to assess critical listening comprehension skills as the client answers questions, identifies cause-effect relationships, makes inferences, and proposes solutions for story problems. You can use the assessment data to easily develop IEP goals. Most criterion-referenced tasks are between 10 and 20 items in length. Now you can assess phonemic awareness in Spanish using short, easy-to-administer tasks. Word and sentence repetition tasks for articulation screening are also included. The book also includes tasks for assessing oral motor problems and apraxia of speech. Strategies are described for assessing how the student responds to instruction. An approach called the Contextual Assessment of Language Learning (CALL) is presented that can be used to distinguish communication differences from disorders and to plan intervention programs. This comprehensive resource also includes informal checklists and forms that can be used to record observations in the classroom, lists of questions that can be asked during parent interviews, assessment tasks relevant to common IEP goals, language sample protocols, and other resources. 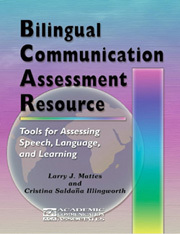 The Bilingual Communication Assessment Resource is an essential book for speech-language pathologists, special education specialists, and others who work with students from bilingual backgrounds. No other assessment inventory on the market provides as much information as the BCAR. Every assessment form may be reproduced!